A belt for life! 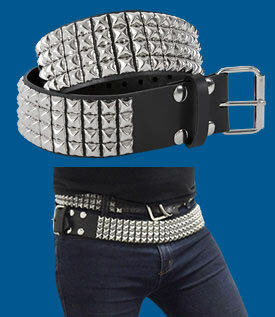 Four rows of chrome pyramid studs adorn this high quality leather belt. These belts are handmade locally just for us from thick 100% Black Leather and will last as long as you do! 2-1/4" wide. They're also made with detachable buckles so you can customize 'em. XS=27-32", S=30-34", M=34-38", L=38-44", XL=42-49", XXL=45"-53"